Time to learn about the good things in bread mold and blue cheese. Yep, let's teach the kids about penicillin. In bread mold, Penicillium consists of a network of filaments (hyphae) known as a mycelium (white). It has numerous reproductive spores which are the green/grey areas. 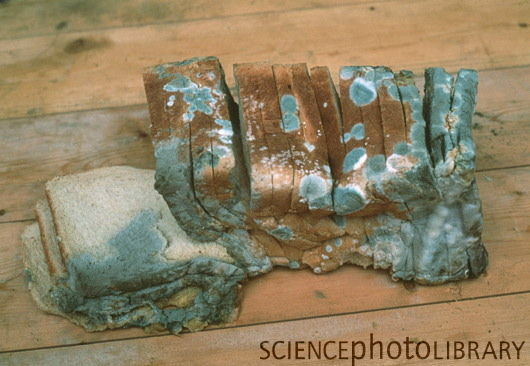 The mold is penetrating the bread, using the moisture and nutrients to grow. 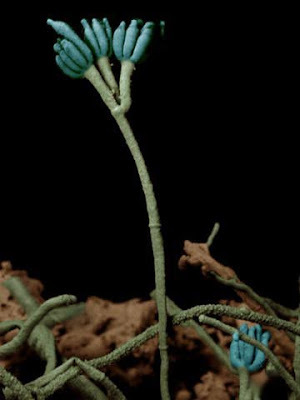 There are many forms of Penicillium, some of which we eat -- in cheese. I love Brie and I love blue cheese. It's also used in making gorgonzola cheese. And of course, it is used as an antibiotic.